The Archive's main collection of sheet music and orchestrations, the Hogan Jazz Archive Sheet Music Collection is accessible via catalog cards in the Hogan Jazz Archive reading room. Other major sheet music collections include the Louisiana Sheet Music Collection and the Maxwell Sheet Music Collection, which are searchable online via the Tulane Digital Library (TUDL) and Archon, respectively. 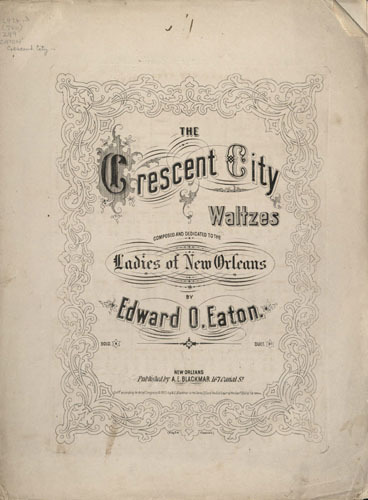 The Louisiana Sheet Music Collection is comprised of sheet music published in, or with topical relevance to Louisiana (with an emphasis on New Orleans). Many important local composers are represented, including Basile Bares, Eugene Chassaignac, Edouard Dejan and Louis Gottschalk as well as several interesting, but lesser known composers. The collection covers 100 years in the history of local publishing (1838-1938) and represents a wide range of styles of popular and vernacular music. Browse and search selections from the collection at the Tulane Digital Library (TUDL). The full collection is accessible via catalog cards in the Hogan Jazz Archive reading room. The Maxwell Sheet Music Collection is currently being inventoried in Archon. A finding aid will be available shortly.